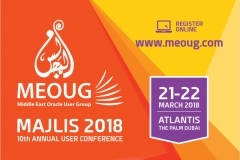 Middle East Oracle User Group (MEOUG) - an Independent Oracle User group will hold its Annual Conference MEOUG MAJLIS. An exciting day of Oracle Roadmap, User Case Studies, SIG meetings and Round table. The Middle East's Leading ICT Event focus on Oracle Technologies. MEOUG MAJLIS is the only platform in Middle East, for Oracle Users to Learn & Share. As an End User forum, MEOUG MAJLIS 2016 benefits users of entire stack of Oracle products to gain better value from their Oracle investments. Develop your network of contacts by interacting with Oracle customers, System Integrators, Consultants, developers and representatives from Oracle Corporation. Modern Supply Chain Experience: These industry experts will share how they are supporting new opportunities and enabling extraordinary results; the conference will give you the tools you need to drive innovation and maximise revenue. PaaS: On top of the daily challenges of maintaining a high performance database, now you have to be sure the data are available 24×7 and compatible with other systems. This track provides DBAs of every experience level and industry with the tools to productively and creatively administer data. Engineered Systems: High performance is key, but software and hardware conflicts can sap your speed. Maybe it’s time to consider Engineered Systems and take advantage of a pre-integrated solution with some serious power. Learn how to optimize your database performance, decrease your time to production and reduce your overall costs with the family of products within this track. EPM, OBIEE and Hyperion: Enabling organizations to function more efficiently and make better decisions is more than just designing and knowing to use analytics, but also implementing a combined solution with business processes and knowledge as well as architecture of tools and database solutions. BI and analytics are about better decision making and supporting an organization’s competitive edge. Learn how organizations are using BI to transform their operations and sustain their competitive advantage. Join MEOUG and MAJLIS 2016 to Connect, Communicate & Collaborate how innovation can be achieved without complexity. Come learn from the experts how to simplify your IT investment by putting the latest technologies into practice to drive your business performance. Membership Duration: Valid for 1 year from start date of the membership and every year member has to renew. Events: Can attend all SIG Days and MEOUG MAJLIS Annual Conference organized by MEOUG, member must register for the event. Opening Note Haya Alghanim, Chairperson of PAB (Partner Advisory Board), CEO,JMT Al Ghanim Co.
Cliff Godwin is the Senior Vice President of Applications Development at Oracle Corporation. Mr. Godwin is responsible for the Oracle E-Business Suite business. Mr. Godwin has been a member of the senior management team of Oracle's Applications business for most of his 24 years at Oracle. Prior to his current role, Mr. Godwin led the Applications Technology Group which is responsible for ensuring that the Oracle E-Business Suite effectively leverages Oracle’s systems technologies, and for building the common objects and services used throughout the Oracle E-Business Suite. Mr. Godwin holds M.S. degrees in Mathematics and Operations Research from Stanford University, and an M.B.A. from Harvard Business School. In this session, hear from Oracle E-Business Suite General Manager Cliff Godwin as he delivers an update on the Oracle E-Business Suite product line. Cliff will also discuss how many of the industry trends such as Subscription Economy, Industry 4.0, Big Data, IoT, Mobile and the Oracle Cloud are being adopted by E-Business Suite today and the future. You will come away with an understanding of the value Oracle E-Business Suite applications deliver now and in the future. Oracle E-Business Suite is a powerful, complete suite of applications that can deliver tremendous value to organizations around the world. That value can be greatly extended when coupling it with Oracle Cloud solutions (SaaS, PaaS and IaaS). In particular and with the introduction of Oracle Compute Cloud Services (IaaS) and Oracle Database Cloud Service (PaaS), customers can now deploy Oracle E-Business Suite applications on Oracle Cloud. Whether you are on 12.1.3 or 12.2.x, this session will show you the value proposition and benefits delivered by deploying Oracle E-Business Suite on Oracle Cloud. Eric Maikranz serves as Oracle’s Chief Customer Officer for the JD Edwards product lines. He brings over 15 years of product development, product implementation and product upgrade experience to this role advising Oracle customers on how to maximize their investments in JD Edwards ERP. Jeff Erickson leads the Technology Product Management team for JD Edwards and has been working with JD Edwards EnterpriseOne for 20+ years. This team is responsible for driving product innovation in the area of Tools and Technology including user experience, Internet of Things (IoT), One View and cloud. In addition to product management, he has lead JD Edwards’ development teams and has consulting experience as a Global Advance Technology consultant. Rama Sharma is a thoroughbred ERP professional, who has worked across geographies in a vast range of ERP Projects. He successfully delivered a complete Oracle engagement for Oman LNG under very challenging conditions. A complete Red stack, wall to wall Oracle implementation was delivered from concept to stable support within budget. Prior to that, Rama was an AVP in Mahindra Satyam’s SAP Practice, Practice Head in CyberTech US and a Senior Manager in KPMG Asia Pacific. It all started with “Islands of Systems” identified as a corporate risk wherein Oman LNG decided to adopt and integrate its business processes into a comprehensive Enterprise Resource Planning (ERP) solution. With the endorsement of the Board of Directors and approvals of the Oman LNG Leadership. Muhannad is a Senior Director of Applications Development at Oracle. Muhannad has been with Oracle E-Business Suite for the past 16 years, playing different roles in various product families and technology groups. Muhannad received internal and external awards for different accomplishments and outstanding customer support. Muhannad has a B.Sc. in Electrical Engineering from the University of Jordan. Oracle E-Business Suite Information Discovery (formerly known as EBS Extensions for Endeca) is an organic extension to your E-Business Suite implementation. The suite of modules transforms user interaction by bringing data discovery to the enterprise. It increases user productivity and enable users to take advantage of the accumulated wisdom in the system to make better decisions. This session covers innovations, features, and footprint of E-Business Suite Information Discovery Release 6 as well as visibility into future plans. Mr. Shenoy is a Vice President at Oracle Corporation and global development head for Oracle E-Business HCM development and Fusion Talent Management Applications Development. He is responsible for the development of the full suite of E-Business HCM products including, HR, Payroll, Localizations, Benefits, Learning Management, iRecruitment, and Time & Labor. He also responsible for Fusion Talent Management suite of cloud applications development for products including – Goal Management, Performance Management, Profile Management, Talent Review and Succession Management. Since joining Oracle in 1999, he has worked in various development roles with Oracle E Business Suite HCM Development. In this session, representatives from Oracle E-Business Suite HCM Development Executive management will share their vision, key focus areas and roadmap for the product line. They will also highlight key new features and capabilities added to the product line in Release 12.1 HRMS RUP 8 as well as Release 12.2.5. Steve Tonas has been working on E-Business Suite the past 15 years and is currently responsible for the Strategy and Development of Supply Chain and CRM products. He also manages the E-Business Suite Information Discovery product set. Steve started his career working in Oracle’s Database Development organization and has also worked at early stage startups. Come to this session to learn how Oracle E-Business Suite EAM and Field Service are being tightly integrated to Oracle's Internet of Things (IoT) Cloud Service. Machine learning analytic applications such as Predictive Maintenance and Location-based Services will be featured. You will also learn how Mobile Maintenance and Mobile Field Service applications play a vital role in the Internet of Things. Jawed has over 25+ years of IT industry experience in IT Management, ERP Project Management, IT Consulting, ERP implementations, and programming, development, application design. He has sphere headed the entire ERP project since its inception till completion. He has successfully conceptualized the custom BI and Employee portal projects and executed with internal consultants. EKK developed a custom extension for Oracle e-Business suite using Mobile Application Framework (MAF). Application is being used from iPad and looks like native tablet apps. Roland is the Vice President of Finance strategic Projects and business intelligence at First Gulf Bank. Information Technology Professional with 9 years of experience in leading, managing and delivering business process automation and IT transformations through strategic Enterprise wide ERP and business solutions for organizations across diverse industries. Successful track record in consistently achieving significant targets and employer satisfaction. Khaleefa Butti Bin Omair (KBBO) Group discussing on how they invested in the Oracle ERP Cloud to manage multiple entities across the globe, maintain being a leading investment group within the UAE and the Middle East. Also on how the Cloud solution increased the management control, operational investment and investment efficiency, reduced staff workload and ensured a low total cost of ownership. An experienced IT Professional, having over 13 years of rich and insightful experience, including over 12 years of experience in the UAE; Involved in Solution Development, Support and Pre-Sales, exposure to Multiple Technologies and experienced in Business Automation for Aviation, Telecom, Real Estate, and Retail verticals. Major implementations include Oracle Marketing and Sales Cloud, Oracle ERP (R11, R12), Data Warehousing and Business Intelligence, CRM, Sales & Leasing Portals, numerous in-house Business Process Automations and Cost Savings, Crew Applications, Catering, Duty Free, Departure control and Airport Services Applications, Mobility Solutions, Retail and GSM Solutions. During the career span, he has Led/Managed multiple Projects, involving development, integration and support of solutions for many clients, with strong experience in Project Life Cycle, Software Development Life Cycle, Business/System Analysis, Pre-sales Support as well as Team Management. Aldar had a requirement to increase its market share and revenues across a portfolio of assets ranging from Property, Asset Management, Malls and Hotels. In order to achieve this, it identified a need to extend and better exploit its prospect pool by utilizing its diverse range of – previously unintegrated – sales and marketing channels. There were several core considerations to factor into the project, so flexibility in the integration process was essential. First, a newly developed customer strategy and recently mapped customer journeys placed specific demands on the way that this integration needed to happen. Second, unique challenges were presented by the breadth of channels integration, nature of the customer base and the market’s stage of digital evolution. Third, the business teams were working in silos; maintaining customer/visitor information in multiple data sources and with many property purchases continuing to come from existing customers. Integration with the ERP system was critical, as well as with new & existing Aldar digital assets. Even with these constraints, the time from the appointment of the implementation partner to the launch of the first campaign was less than 3 months. Kumar Prasoon is the Chief Information Officer (CIO) for Safeer Group. In this prominent role, he makes technology recommendations for the group’s executive management on the aspects of business intelligence, cloud computing, enterprise 2.0, integrated systems architecture and virtualization. Kumar Prasoon is an ICT Industry Process Centric seasoned Enterprise Architect and Business Process Management Expert. Kumar Prasoon excels at leading cross-functional teams across Americas , Europe and Asia ; coordinating multiple projects with exceptionally strong understanding of the business issues driving software development based on experience both as a seasoned Enterprise Architect as well as Interface Manager with solid approaches towards Integration Technologies / Service Oriented Architecture using external interfaces concerning Systems Integration / Systems Architecture / System Infrastructure support for Mission Critical Applications and a prominent International Speaker on many conferences like Dubai World Trade Centre (DWTC) , Computer News Middle East , Innovation Enterprise (USA) , International Retail Summits , Forrester Research , Neilsen , International Data Corp (IDC), Arabian Computer News (ITP Publishing), CAXTON GROUP(USA) , SmartData , Expo Trade and Real Time Communications (RT-COM) by Flemming Gulf to name a few. Al Safeer Group, a diversified conglomerate with interests in retail, malls, entertainment and real estate across the Middle East region, has selected Oracle® Retail applications and the Oracle E-Business Suite to integrate its business operations, improve decision-making and optimize inventory and customer service levels. The Oracle Applications provides Al Safeer , a single platform, replacing Al Safeer’s legacy disparate systems, to consolidate all financial and operational information and deliver extensive benefits across the business. In addition to the Oracle Retail merchandising, stores and corporate administration applications. 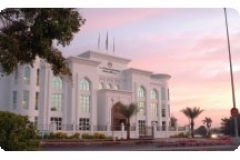 Al Safeer uses Oracle E-Business Suite for financial management, human capital management and projects. Oracle Retail enables Al Safeer to coordinate merchandising and supply chain operations, helping to optimise inventory, store and division performance and deliver a better customer shopping experience. With enhanced visibility to its retail operations, Al Safeer aims to collaborate more effectively with suppliers, improve tracking of inventory to reduce stock levels in stores and warehouses and improve profitability. Mr. Khaiata is currently heading a Business Transformation Program for Al Ghurair Investment; one of the largest conglomerates in the GCC, prior to that, Mr. Khaiata Implemented and managed Corporate Systems for Depa; one of the largest interior contractors in the world to enhance their business efficiency. He Holds Master Degree in IT Management and is Oracle Certified Professional and Project Management Professional. Demonstrating the journey of overcoming the challenges faced in a business transformation program across several geographies, business functions, technologies and platforms with an average of 1,600 man-hours spent daily and 15 engaged CXOs for two years. The program is based on five pillars; mainly, business consultancy, organizational change management, system implementation, infrastructure revamp and quality assurance. The program main objective is to deliver tangible results through defined framework of Business Value Articulation to support the profitable growth strategy of the business by enhancing the efficiency, visibility, agility and improving the level of control and governance across all subsidiaries. Zeeshan Umer is an Oracle applications expert and keen learner of new technologies. Combining a mix of program management and functional knowledge of multiple technologies he has completed 40+ Oracle E-Business, Hyperion Planning cloud service, Hyperion Financial Mgt & Business Intelligence implementations across industries & regions over the span of 12 years. Zeeshan is heading Group IT system implementations team in Bukhatir Group and has transformed numerous business processes through automation & provided business insights through efficient systems to leadership teams. Bukhatir Group uses Oracle EPM Cloud to deliver business insights & benchmarking KPIs specific to industry processes. As a Senior IT Manager, Mr. Jawad Hasan Syed is responsible for managing technology infrastructure and applications for multiple companies working under “Ewaan Global Residential Group” in real estate development sector. A sound professional with strong academic background and around 18 years of experience in consulting, systems implementation & project management across industries and geographies -GCC and Asia-, he has helped a number of customers to improve and innovate business processes in order to achieve organization strategic objectives. A vivid learner and an excellent trainer -delivered trainings for Oracle University- he is always eager to learn and adopt new technologies for personal and organizational development. Ewaan is more than a company building real estate projects. It is dedicated to the craftsmanship involved with conceiving living communities that are inspired by our surroundings, thus providing wonderful feelings and hidden potentials, and urging us to develop them in the best and most respectful way possible. information technology department has been initiating and delivery a number of projects for the last many years. advantage to the “Strategy & Business Development” department for its future initiatives. Vinod is involved with customer support for the past 26 years in various Technical and Managerial roles. Is an evangelist, driving Premier Support strategy around creating Support value awareness and encouraging adoption of Oracle Support best practices across the region. 6 years experience at Oracle. Prior to joining Oracle, was with Sun Microsystems for 10 years. Vinod is a holder of Bachelors in Engineering from University of Madras and Masters in Business Administration from GCSU, Atlanta. Since September 2010, Abdul Rahman Al Thehaiban is the Oracle’s Senior Vice-President for Middle East, North-South Africa, Turkey and Central Asia. Prior to this post, Abdul Rahman has managed the Public Services in MEA. Abdul Rahman joined Oracle in 1996 as Sales Director for the Saudi operation where, in three years, he helped propel the annual revenue growth, catapulting this region to be the largest in Middle East. At that time, Oracle subsidiary in Saudi was awarded ‘the Oracle leadership award’ across Europe, Middle East and Africa. Named ‘Best General Manager in Business Development in Saudi Arabia for 2005’ by the leading technology publishing group ITP, Abdul Rahman is also an executive board member of the Young Arab Leaders (YAL) group, an association of individuals who take an active and responsible role in improving the state of the pan-Arab world. Oracle subsidiary has won in the 2009 ‘Best Working Environment award’. Forbes Middle East Magazine selected Abdul Rahman among the top 100 executives in the Middle East. He was ranked number 20 for the year 2015/2016. Ranking was based on the top Global 2000 companies. Abdul Rahman was named ‘One of the top 10 most powerful executives in the IT Industry in Middle East in 2011’ as per the survey conducted by Arabian Computer News’. Abdul Rahman was ranked number 6. Abdul Rahman brings over 22 years of industry experience to Oracle inclusive of more than 16 years of executive management. Prior to joining Oracle, Abdul Rahman owned a leading software solutions consultancy that was specialized in Application development in Unix, Informix and Oracle. Al Thehaiban has an Executive Masters degree International Business from the University of Edinburgh (2004), and is married with four children. An oracle professional with over 20 years experience. PeopleSoft Campus Solution and its other predecessors have long been fulfilling the requirements of the conventional requirements of keeping Student Records and other related information. Now it's time to have a leap forward, not a quantum leap but recognizing the opportunity of getting into providing intelligent solution like Oracle is already doing in case of introducing Students Analytics. Academic institutions have long been taking about this fact which is defining the Program/Course level course objectives and then try to analyze the performance indicators to assess the delivery of the execution phase. Samina has been with Oracle for 15 years and leads the business development team for Big Data across Eastern and Central Europe, Middle East and Africa. Her team evangelizes Oracle’s innovative Big Data Solution and aims to deliver value to business in the context of the Big Data Management value chain. Now, with Big Data Cloud Service, the team works with customers to transition and transform their IT environment and prepare it to serve the modern Enterprise. Prior to her current role, Samina was leading the prestigious Oracle Insight team for the Middle East Africa region. Samina’s experience as a management consultant combined with her extensive knowledge of the IT landscape positioned Insight as a high-impact, value selling resource in the region. Samina has had the privilege of working with customers across industries and geographies. Samina is an alumnus of The American University in Washington DC (Computer Sciences), The George Washington University in Washington DC (Information Systems Management), and the Lahore University of Management Sciences in Pakistan (MBA in Corporate Strategy and Finance). She is a Certified Project Management Professional with PMI, and a Certified Director with International Finance Organization. Swami has over 18 years of direct experience across Middle East, Africa, Europe, Asia Pacific and Japan with a focus on SaaS Solutions. Has extensive experience in Comms, Media, Utility and Aviation, FSI, Retail, Professional Service Industries in Application Sales, Business Development, Implementation, Consulting and Major Account Management. Swami brings extensive experience CRM, ERP, EPM and other edge application Sales, Solutions, Consulting & Professional Services for the above industries. Prior to Oracle Corporation, Swami worked with General Electric Company in IT consulting and Implementation for GE European Operations, GE Plastics Japan and GE APAC. Also worked with IT consulting organization Satyam Computers in Sales and Consulting in MEA. Prior to that Swami was associated in Application Product development with Ramco Systems Ltd. Also worked with Oracle Corporation, India in Global Support & Product enhancements. While working with MEA region, Swami was closely involved in large multinational organizations in the region on a.Drawing their IT Roadmap b. Consultative Selling approach towards their CRM, ERP and EPM requirements, c.Relationship with C Level. d.Trusted Advisor in their IT transformation projects. Swami is a Chartered Accountant from Institute of Chartered Accountants of India with 18 years post qualification experience and holds a graduate degree in Commerce. He is based in Dubai and travels extensively in Europe, Russia, Middle East and Africa. Ali Kekhia is the Group IT Director of one of the largest interior contracting group in the world. For the last ten years Mr Kekhia manages and supervises the entire IT departments of 28 subsidiaries and 7000 employees across Middle East, Europe and far east . He has transformed the IT Department from basic service provider to a business enabler that supported the growth of the business over the previous years and provided the required visibility, real-time reporting, governance and control. Ahmed is the Cloud Computing Leader for Eastern & Central Europe, Middle East and Africa. Ahmed has been working for Oracle for the last 15 years during which he led MEA FMW Solutions Specialist team, Managed Technology Presales for Comms Sector in MEA as well as various regional presales roles. Cloud computing is transforming business and IT by enabling greater agility with lower cost and risk. As cloud computing moves to the mainstream, it is time for your organization to develop your cloud strategy and roadmap that supports current and future business needs. Learn how Oracle helps customers succeed in their journey to their cloud through a broad portfolio of cloud solutions across SaaS, PaaS and IaaS services deployed in public, private and managed cloud models. Arun Khehar is the head of Applications for Middle East and Africa. Arun Khehar studied Engineering in Sweden, followed by a Master’s Degree in International Business from University of Edinburgh - Scotland - ENPC Paris in 2004. Prior to taking over the role of VP of MRD Middle East & Africa, Arun Khehar played a pivotal role in establishing new businesses for Oracle (Business Intelligence & Data warehousing, CRM, ERP, Industries specifically Retail, Automotive & Real Estate) and executing very successful sales and marketing strategies around them. Arun Khehar brings over 20 years of Information Technology industry experience to Oracle. From 2004 to 2008, Arun Khehar managed the Innovation Program for EMEA as part of Oracle’s Vision 2010 program. Arun Khehar is also the Applications Board Member for EMEA. Arun khehar is also part of the ECEMEA management board. She has 15+ years of experience in IT and ITES industry and hands-on experience in setup and administration of HP-UX/Linux servers, Windows servers, Solaris, Oracle VM server and manager. He is the program manager of MyDAS project and played pivotal role in driving forward this technology driven technology initiative that yielded right results. Earlier, he worked in du telecom as Director of OD & Manpower planning. During his tenure he drove many transformation programs, developed KPIs and performed efficiency reviews. He also managed portfolio of manpower, job evaluation and employee engagement. He holds a bachelor’s degree in Computer Science and MBA in operations management from University of Toledo, USA. He is also certified in six sigma, balance scorecard, compensation design, Hay’s job evaluation methodology etc. In the year 2015, Dubai Airports HRD (Human Resources & Development) business unit embarked on Oracle HCM cloud journey. The strategic objective of the MyDAS project is to support HRD transformation from an administrative function to a strategic business partner and to achieve highest level of HRD maturity. MyDAS will empower employees by providing them tools to become more effective in delivering their jobs. MyDAS will provide seamless user experience and will support end to end business process flows. He is driving the project objectives on the ground and managing all technical and functional workstreams in parallel along with Oracle consulting and Andryan teams. He holds bachelors in electronics engineering, masters in Industrial Engineering from NITIE Mumbai, masters in investment banking from ICFAI. He is certified in manpower planning, Hay’s job evaluation, Compensation & benefits, CPIM, CIRM, CABM, PMP, Oracle Fusion HCM and e-business suite. As part of his role as Head of ICT Business Applications, Hassaan is a key driver and executor of all Business Analytics initiatives within ENEC, of which he has been an employee for the past 3 years. Graduated in Computer Sciences, Hassaan also worked for Emirates Airlines, Teradata and KASB Bank in the past and his off-work interests and hobbies involve sports and working out. As Data Management Section Head of GASCO (Abu Dhabi Gas Industries), Sulaiman manages the award-winning GASCO Enterprise BI Platform, currently serving all operations and support functions across the many GASCO sites. Previously heading the team responsible for GASCO suppliers’ related systems within IT operations section, Sulaiman has been involved in Information Technology since 2008, and enjoys swimming and table tennis during his free time. Meera holds a Masters degree in Computer Applications and is an experienced IT professional with 18 years of experience in Application development, Support with strong expertise in Retail domain. He was part of Oracle Retail roll out at KOJ and played major role in Stabilizing, Improving utilization, developed numerous In-house solutions using Oracle. He now heads Digital Innovations at KOJ group. KOJ has built an In-house developed Helpdesk application, using Oracle Application express in 2 months. Total savings is around a Million Dirham. Applaud are an Oracle partner who offer phone, tablet and desktop apps for Oracle HCM. Formed in 2008 by experts in the Oracle HCM community, we help clients modernize their Oracle E-Business Suite HCM implementations with an improved desktop user experience complimented with mobile apps for iPhone, iPad and Android devices. We are the world’s leading supplier of mobile applications for Oracle E-Business Suite. We just want to make reporting easier. It’s that simple. Since our founding in 2005, we’ve done exactly that with passionate people, phenomenal solutions and fanatical support. Every day, our people make our mission a reality. When a customer sees one of our products and says, “I’ve been waiting 20 years for something like this” (and they frequently do), we know we’ve done our job right. Our people collaborate in a super-charged environment where hard work and having fun happily co-exist. OracleSkins is part of Appsynx - the only Oracle Partner dedicated to UX! Our Oracle Skins allow customers to transform their Oracle Applications without the need to customize! Remote cost-effective solution, fixed-price, with a 2 week turnaround! TransSys Solutions is an Oracle Platinum Partner with a vision and deep understanding of the industry, technology and market that have a real-world impact on business operations. At TransSys, we believe that innovation and transformation is critical to the success of any business. As a renowned Oracle Solution and Service Provider we combine the power of Oracle's best-of-breed products along with our proven experience and deep expertise to design solutions aimed at transforming and delivering measurable business value to our clients. AppSys Global is an Oracle Gold Partner, a consulting firm providing complete technological services which primarily involve Oracle based solutions. Tech Channel MEA is an online content portal, focussed on the IT channel and partner industry across Middle East and Africa. The content is focussed on sales, technology and industry dynamics between vendors, channel partners, and end users. The primary categories include technology and industry announcements, wins, tie ups, channel, partner programme, SMB products, enterprise products, event news, event gallery, expert columns, convergence, cloud, storage, security, mobility, research and surveys, calendar of events, industry quotes, and white paper documents. The portal publishes its content on the web site and has outreach through frequent newsletters and social media postings. Viewers can register for the newsletter through the website link and Like or Follow the social media portals. MEOUG MAJLIS 2016 is using #MEOUG, in Twitter hashtag language, is a huge topic of conversation amongst Oracle professionals on Twitter. With all the talk online about MEOUG MAJLIS 2016, social media provides numerous great opportunities for you to promote your presence at this year’s conference. MAJLIS 2016 is designed to help users of the full family of Oracle business applications and database technologies gain greater value from their Oracle investments. You can use below different banners in your signature or facebook, twitter or on linkedin, please help us to spread the message.